First Days in Lima | ¡TravelSickness! The cab zipped through the dark Lima night, past ghettos and discos, weaving in and out of traffic. This was our first taste of Latino America, and it finally hit me just what we were in for. This was not the United States, not Europe, not even Eastern Europe. This was a whole other beast altogether. This South American capitol of 9 Million people looked more like a shanty town held together by dirt and diesel fumes than any kind of a city. The old colonial post office is now a market. The next few days were some kind of a blur. The first two days were foggy, sleepy days- both literally and figuratively- and passed quickly as we slept off our jet-lag. We were able to take a small walk the first day with Chini (our couchsurfing host) around Miraflores, along the oceanside cliffs. Afterwards, we promptly fell back into our slumber. On the third day we ventured into the Center for the first time, braving smog and hoards of busses, and did a bit of sight-seeing. Central Lima is actually stunningly beautiful at times, and utterly unbearable at others. It’s filled with colorfully painted churches, colonial balconies, more traffic and diesel fumes than I have ever seen, street vendors of every sort imaginable, old men pushing carts, parks on every other corner, impressive plazas, police with semi-automatic weapons, and of course the occasional gringo guide-book-toting tourist. It’s an absolute mess in so many ways, yet there’s something alluring and raw about it, which is hard to come by in most modern cities, that in the end thoroughly impresses. After five nights staying at our hosts’ house in Miraflores, we decided it was time to give them a bit of space, and we moves to a delightfully strange hotel in Central Lima, the Hotel d’España. A few days before we had noticed the top of one of the buildings downtown covered with an absolute jungle overflowing the rooftop terrace. Lena stopped to take a photo of it, but little did we know that a few days later we’d find ourselves right in the middle of that jungle. The hotel is an old colonial mansion, just a block away from the Monistario San Francisco, delightfully tacky, and filled with the strangest assortment of animals who have free reign of the terrace-jungle. We checked in and walked up to our room on the third floor, and were met by two lazy tortoises, one cat, two parrots, and a flock of pigeons. The vines cover most of the balcony, strange greek-esque statues brighten the clutter, and from the roof there’s a great view of the back of the monastery. So this was colonial Lima in the 21st century… Worn-out and falling down, covered with vines, but with just enough charm to capture the imagination. Tacky yet refined, impressive and squalid all in one mouthful. I couldn’t wait to see what the rest of Peru might have in store for us… Hopefully a lot less crowded and noisy, but packed with just as much raw culture and strangeness. 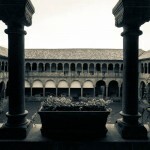 The next day, we took a tour of the Monasterio San Francisco, a Franciscan Cloister from the 1700’s. The tour was relatively unremarkable, but the monastery itself is beautiful. At one point in the tour, we were under the main chapel in the catacombs; From the air vents built into the floor we could smell Frankincense and see into the chapel where people were singing. When the tour was finished, we wandered out into the courtyard and sat on the terraced steps to rest before moving on. Suddenly, we were surrounded by a large group of people, and the doors of the cathedral opened. The faithful pored out and following slowly behind was a group of perhaps thirty men carrying a massive silver idol of the ‘Black Christ’. They were celebrating the Señor de los Milagros (Lord of Miracles), a week-long procession in which thousands of people gather wearing purple and parade through the streets. Its name originated in a massive earthquake in the 17th century, which destroyed most of the city leaving only one mural, which depicted the Lord of Miracles, standing up. 3 Comments on "First Days in Lima"
I like that nature hasn’t exited and co-exists (turtles, birds, etc.) co-habits without fuss in the city. Well glad to hear from you and all I can manage to say is WOW. I would be scared to death. However hearing it from your tongue I can tell you are glad you made the trek. But please stay safe and watch out for Lena. A whole other world over there huh I can’t even imagine so thanks for the experience and pics!